Cracks password for Microsoft Access MDB instantly. (do not need to input the password). + Supports to remove the password from selected Access database. Access Password Recovery is used to crack password for Microsoft Access database files instantly. It also supports opening the Access file immediately (do not need to input the password) and removing the password from Access database file. It is very easy to use, just open the Access database file (.mdb), the password (if has) will show instantly. Access Password Recovery is a tiny application that was developed specifically to aid individuals in retrieving their Microsoft Access databases passkeys, with just a few clicks. This software utility enables you to upload a MDBs only with the help of a file browser, as the “drag and drop” feature is not incorporated. The password is displayed almost instantly after clicking the “Execute” button, in the appropriately-named box. In addition to that, you should know you can copy the passkey to the Clipboard, as well as remove it from the file, with just a click. No other notable features are integrated. CPU and memory usage is low which means that the computer’s performance is not going to be affected in any way, and you can run it alongside other tools, without encountering any kind of issues. The interface is suitable to all types of users, the response time is good and our tests did not reveal any kind of errors or crashes. Taking all of this into consideration, it becomes quite clear that Access Password Recovery is an efficient piece of software when it comes to decrypting Microsoft Access databases. Important (I): supports adding mdb file by drag-and-drop. 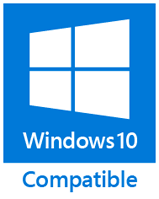 I: supports Win8.1 and Win10. I: supports checking the new version (includes manual and automatic). Supports to close the "About..." interface by pressing <Esc> key. Optimized the resolution of software icon. Added "Find Us on Facebook/Twitter/Google+, Visit Company Homepage, Request eMail Support (Free) and Request Remote Support (Fee-based)" features to the "Help" menu. Can recover the password for the Access 97 database file. Added the menu to the main interface. Can open the selected file immediately (do not need to input the password). Can remove the password for the selected mdb file. 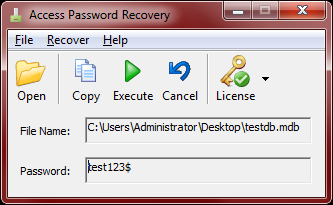 I'm using Access Password Recovery, it is used to crack password for Microsoft Access database files instantly. It also supports opening the Access file immediately (do not need to input the password) and removing the password from Access database file.